The mountain ecosystem has gone for a six with the hill state of Himachal Pradesh following blind plans to keep pace with modern facilities. The lopsided development over the decades has wrought havoc with the fragile hills so much that monsoon rains bring them down, causing massive damage to life and property every year. 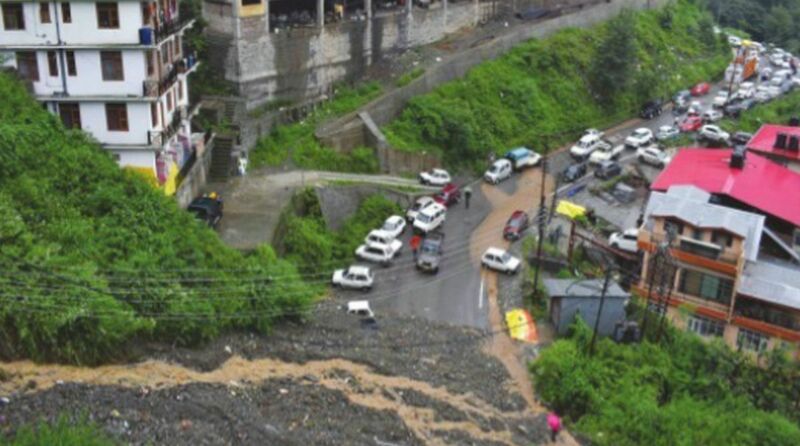 Interior roads apart, the national and state highways see routine landslides in monsoons at different points, bringing normal life to a halt, much due to unscientific tinkering with nature. The urge for urbanisation, massive construction and round the year cutting of hills to carve out wider highways in every nook and corner of the rural state are destroying sustainability of development in the mountain state. While the beautiful state has not worked on tourism as mainstay of economy of hill folks, which could have gone well with local ecology- the hydro-power sector, which was capable of generating income for the state in an environment-friendly manner, too has not been dealt with efficacy by successive state governments. The environment experts feel that despite the fact hydro power is considered to be a clean energy, the execution of the hydro power projects did all the damage to environment and livelihood of people in villages~ who raised voice against it only to be dubbed as the villains of development. “The state did venture into hydro power generation in a big way some years back by involving private sector, but none bothered about the destruction on ground in the process. Firstly, the hydro projects were allotted just everywhere on the rivers without any study on the carrying capacity of basins. And then environment safeguards during execution, which involved heavy construction, tunnelling and axing of large number of trees in fragile mountains, were not implemented strictly. The cracks in mountains apart, it took a toll on the river ecology, crop productivity and displaced natural water sources at many places,” shared RS Negi, an environmentalist from tribal area of Kinnaur. Studies have shown that small hydro projects, at many places, have allegedly damaged the traditional irrigation system of villages, known as ‘kuhls’—again because the safeguards were not followed. The successive state governments have been in a denial mode on all these issues. The environmentalists feel that even the water crisis, like the one in Shimla in May-June this year, in the hill state is borne out of the indifference to strike a balance in development and environment. Apart from misuse by people, the government agencies, which are spending lacks of Rupees on environment protection, have not focussed on optimising the use of resources and the ways to augment them in nature by involving locals. “We have developed the state in such a way that in case of little more snowfall, rainfall or hot summer, we are telling the tourists not to come to Himachal. Is it a sustainable model of development? We need to ponder over. These eco-disasters are man-made and we need to handle them with proper planning in the long run,” they said.